We are following a madman and we have paid him to lead. 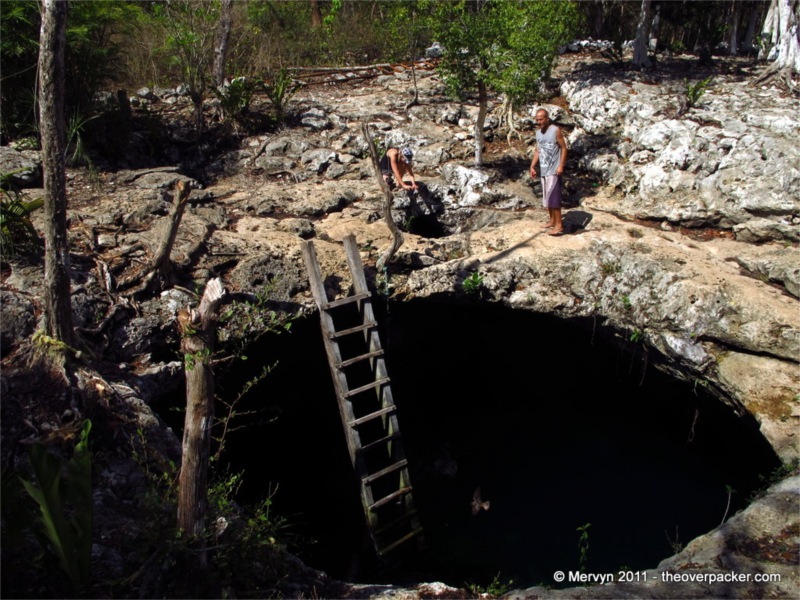 He is Charlie, our Polish guide, and he brings scuba divers through cenotes, the water filled underground caves that dot the Yucatan peninsula. I know it’s cool. I’ve been told. I also know that it’s vehry vehry dangerous. 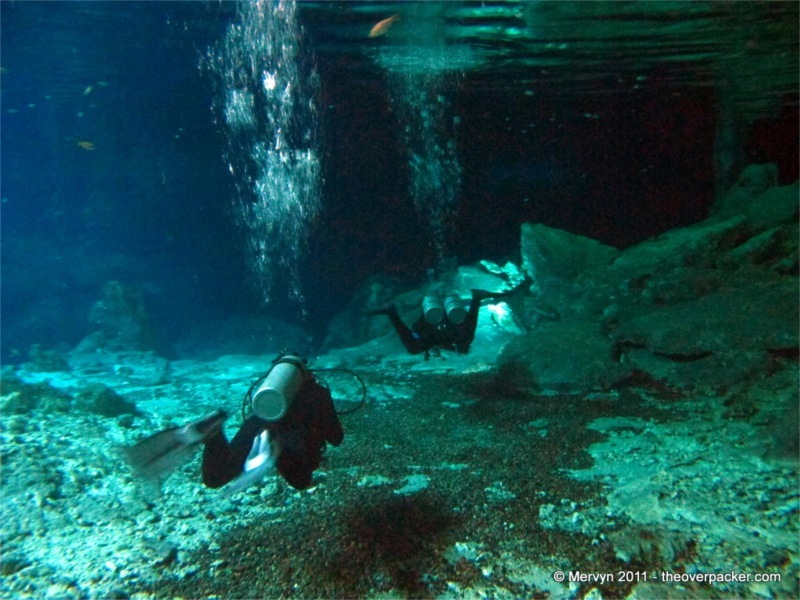 The backpackers that enthusiastically recommended this dive didn’t call it Calavera, though. They called it by its gringo name: Temple of Doom. We are standing in a dirt parking lot, squinting in the tropical glare off Charlie’s beat up SUV. 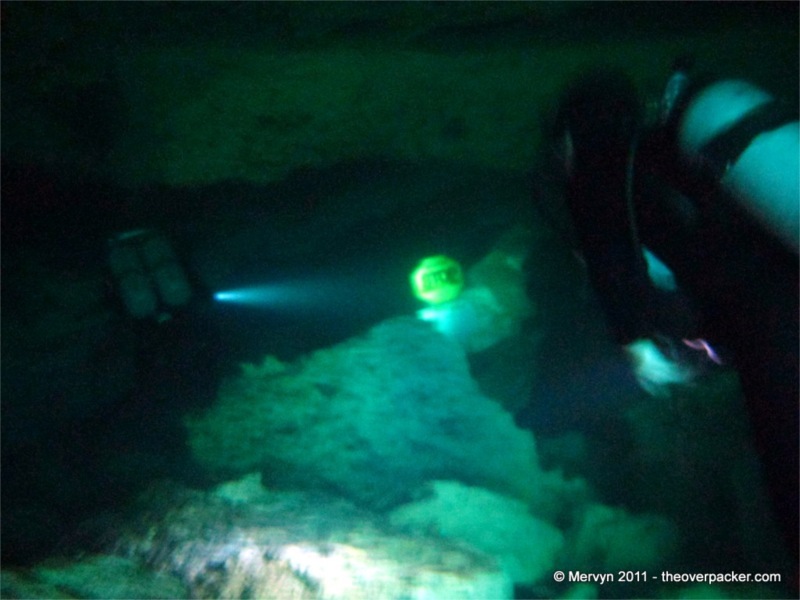 I wriggle into my wetsuit, shoulder 50 pounds (23 kilos) of tank, hoses, and fins and start to walk down the jungle path towards the cenote entrance. The full body neoprene pulls on my already sweaty skin. The humidity isn’t doing me any favors. At least the suit protects me from the mosquitoes. Charlie continues, hands in a flurry. “I do not always take people here. Sometimes the cave is too much. 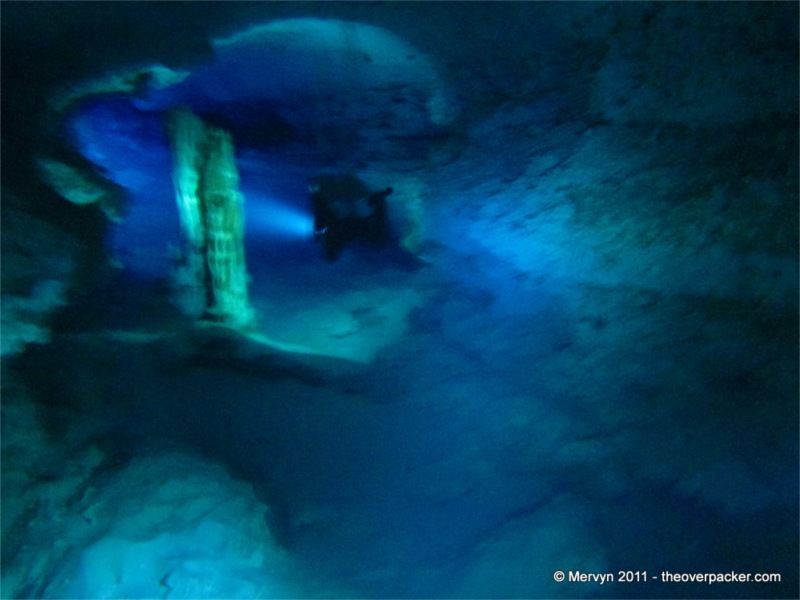 Deep in the cave they freak out,” nodding in the direction of The Skull. “Also, to enter, you must jump 5 meters (15 feet) to the water. Don’t worry, though. You will be fine. 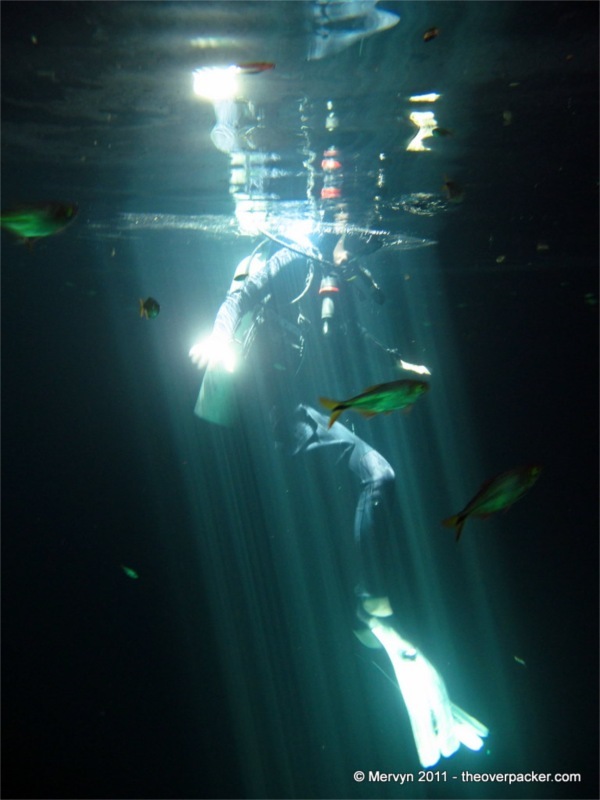 You are rescue diver. You dive good.” He’s right. I am and I do. And I will not freak out. I think. 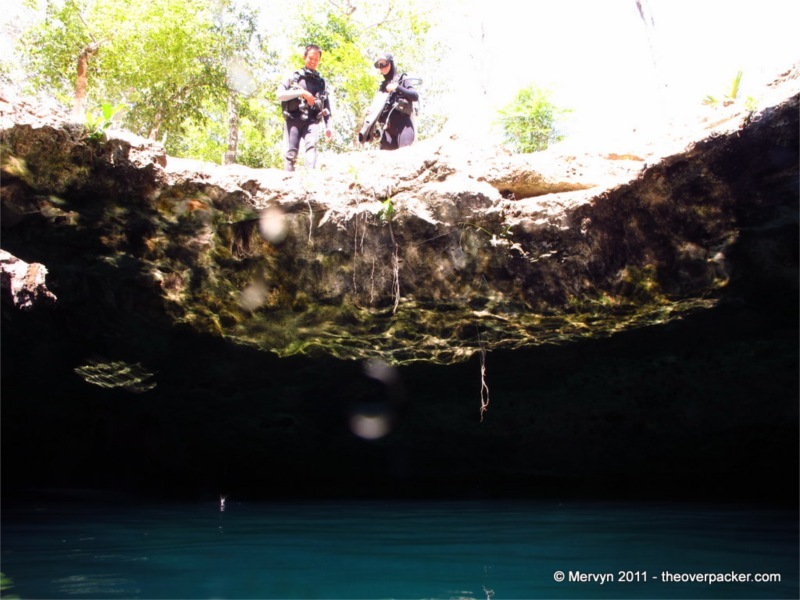 Geared up, we jump off the ledge into Calavera/The Skull/Temple of Doom, dip below the surface and descend into the cave, kicking past a sign that says, “STOP, unless cave trained.” I do not see a sign in Spanish. 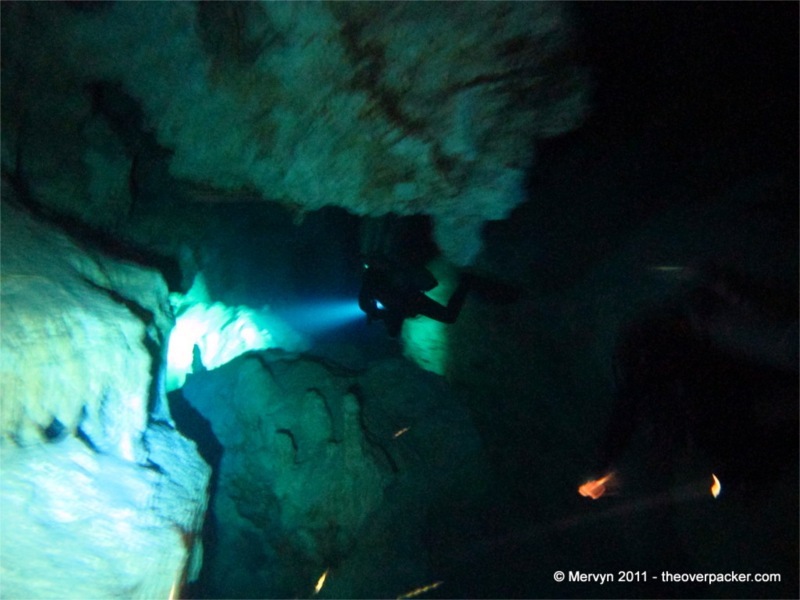 Diving in a cave is like diving at night in the following way: it is dark. 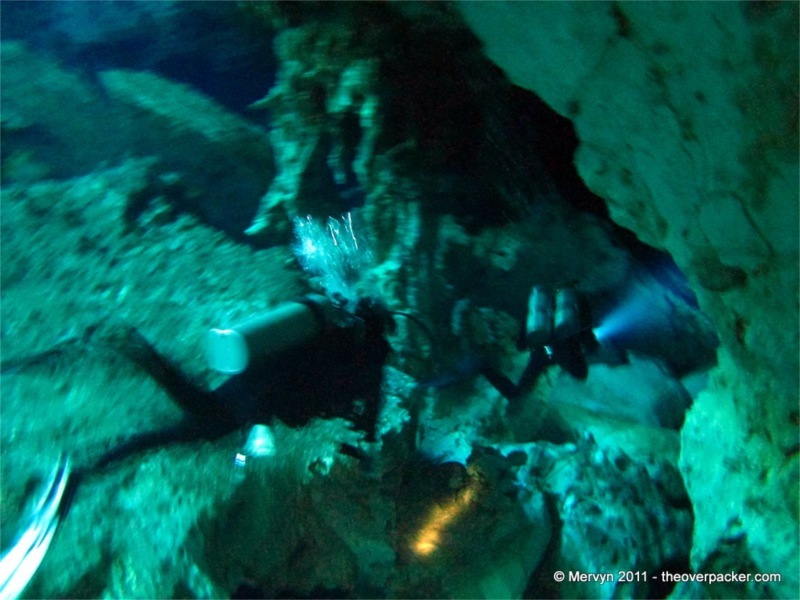 Diving in a cave is different from night diving in this way: you are encased in stone. This means the rules change. In the ocean, when there’s a scuba emergency the solution is easy. If you run out of air, you go up. If you get lost, you go up. If you panic, you go up. 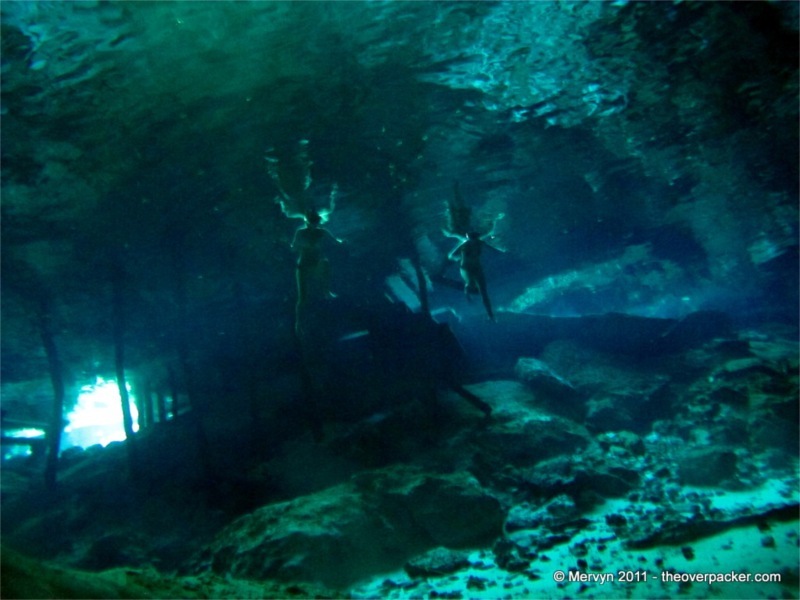 In a cenote, you are surrounded by rock. There is no up. There is only out-back-the-way-we-came. If you bust a hose or your mind cracks, you’re going to have to deal until you swim your way out or drown. That means taking extra precautions. Our guide, for example, is wearing two tanks instead of the usual one. We tourists will still carry only one tank but will use it more conservatively– 1/3 for going in, 1/3 for getting out, and 1/3 saved for emergencies (instead of saving the usual 1/4). 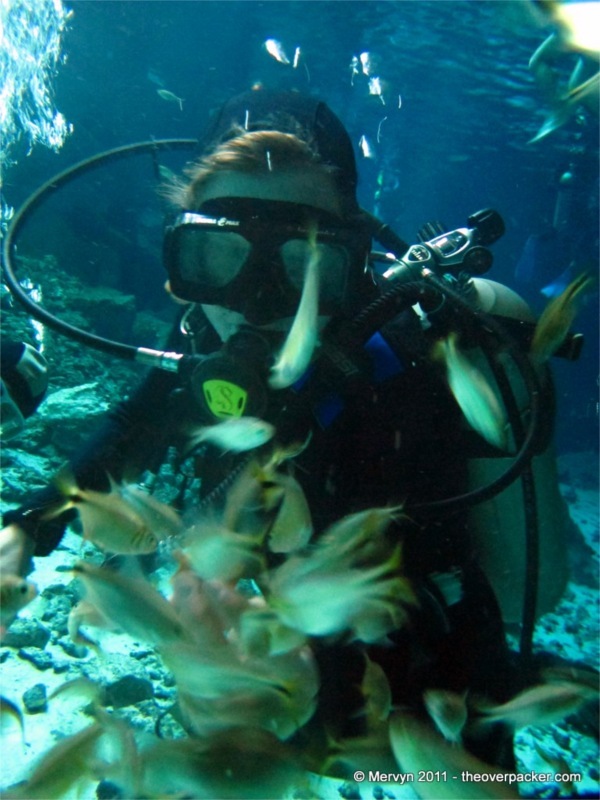 If things go bad, we’ll have to rely on Charlie’s spare or learn how to breathe under water. Here, being redundant is good. 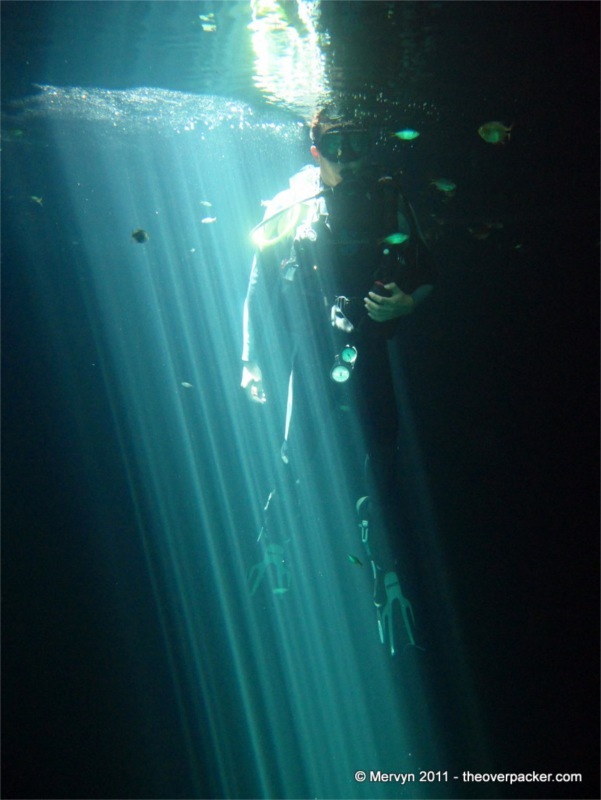 “Do not worry,” said Charlie when we were on the surface, “I have six extra flashlights.” It made me feel both better and worse. 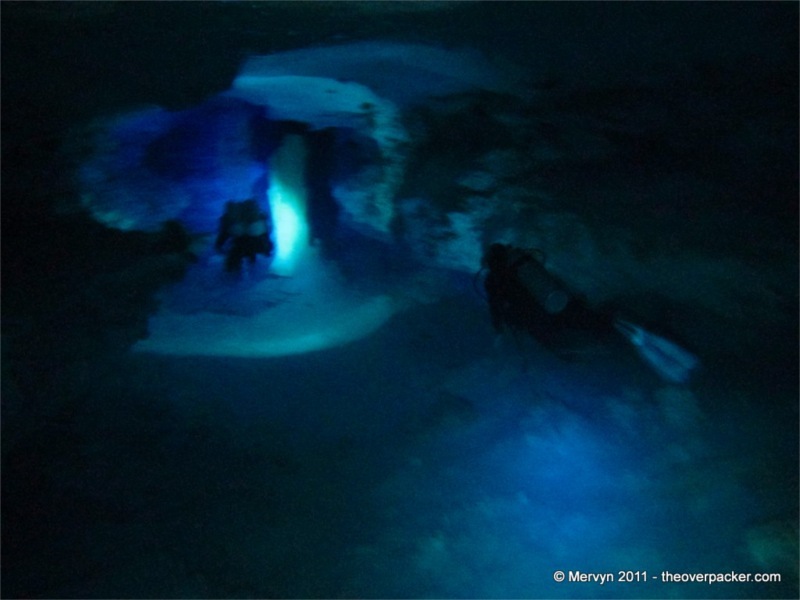 As we glide single file deeper into the cave, I marvel at the water. Here, sixty feet (18 meters) below the rock, it looks clearer than air. 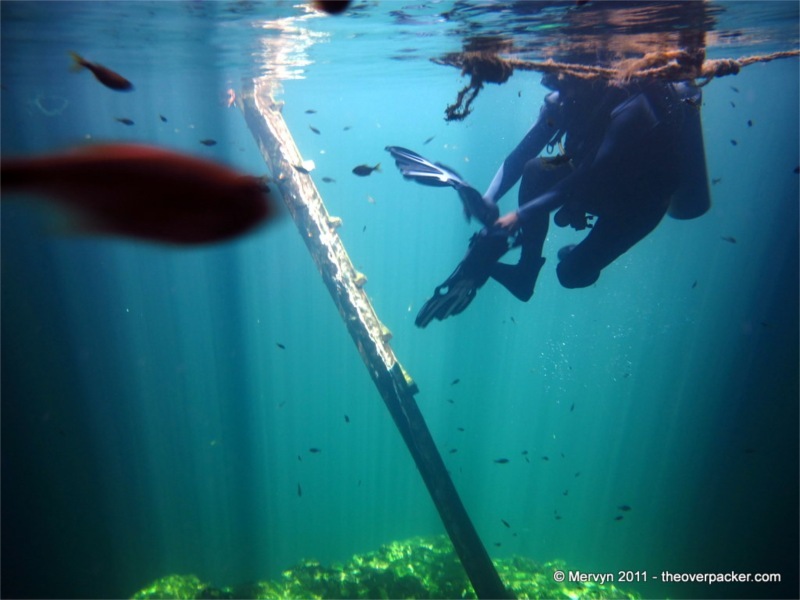 There is no suspended sediment or fish poop. There is no current. Nothing moves. Visibility is as far as your light beam will go or till the passageway turns. You only notice the water after you realize that, for the last 30 minutes, you haven’t noticed the water. In the distance, stalactites dip down from the ceiling and stalagmites rise up from the floor. Tunnels open into caverns that looks like God hired an interior designer who went crazy with melting candle wax. We are like space explorers floating through blue and white tunnels of a cool Jupiter moon. The only sound is my breathing. Then we hit the wondrous halocline. 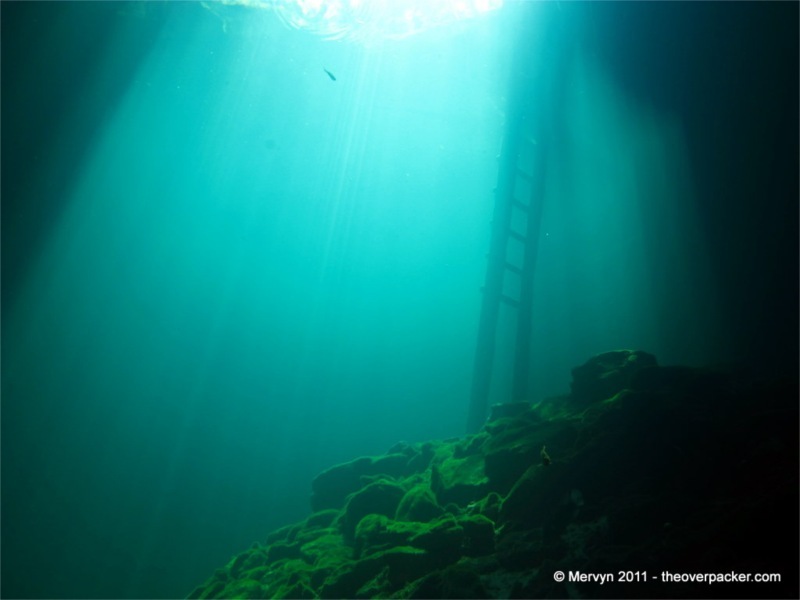 Just 10 meters (30 feet) below the surface, fresh water that’s filtered its way through rock for a thousand years meets salty seawater seeping from below. The salt water is denser than the fresh and, because the cave is so still, the two do not mix—like oil and water. Where the two meet is the halocline. Since we are the first divers of the day, the border between the layers is especially distinct. 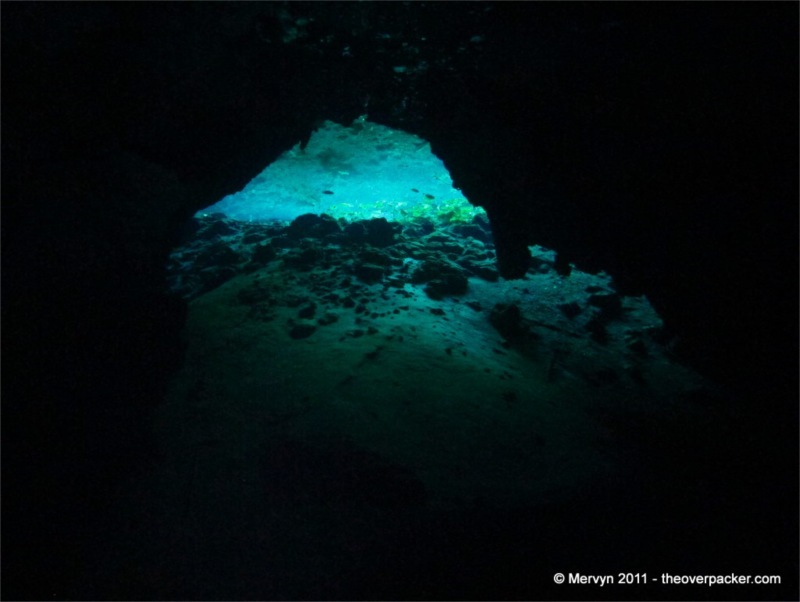 Approaching the halocline from above or below, the light from our flashlights refracts across the border, making it appear as if we are floating towards another surface of water—it’s as if there is a pool within this pool. 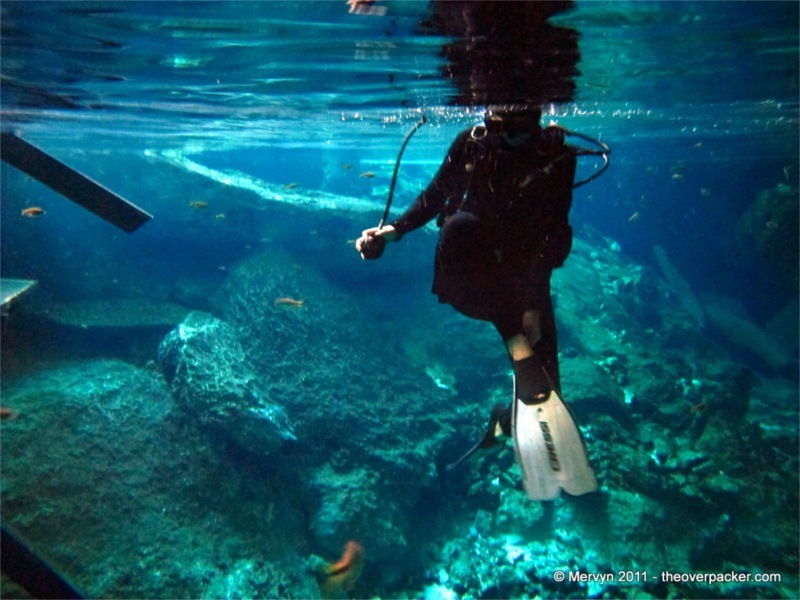 Swimming through the halocline, your movement mixes the layers causing your vision to. . .well, it looks like it does when you’re inside a car during a rainstorm and water sheets down the windshield—everything beyond the halocline is visible, but undulating and distorted. It’s as if everything in your view is obscured by a heat mirage except here it’s cold and dark. The distinct layers of water cause another oddity—the deeper, denser salt water is warmer than the cool fresh water. I swim to the side of my dive buddy. The water clears and I turn to look at her. As Belinda moves from the fresh to the salt water, she draws her hands forward, mixing the two. In front of her moving hand the water is salty, still, and clear but as she slices through I can see water mix, curl, and swirl behind her movement. I can see the turbulence. Just a foot behind her fingers, the swirls resolve into the windshield blur. The effect is everywhere. Around her head, off her shoulders, anyplace that is, for the first time, cutting and mixing the fresh and the salt water. Here, thirty feet underground, I discover what it looks like to see the wind. It’s breathtaking. There are all kinds of crazies; the BASE jumpers; the big wave surfers ; those guys that dress up as squirrels and pretend like falling is flying. 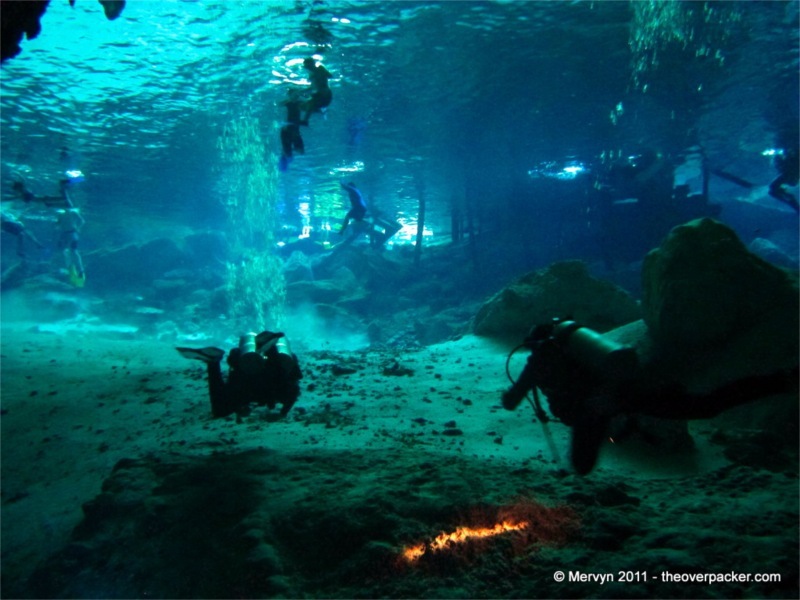 In my book, they’ve got nothing the cave divers that venture into the thousands of unexplored cenotes in Mexico. 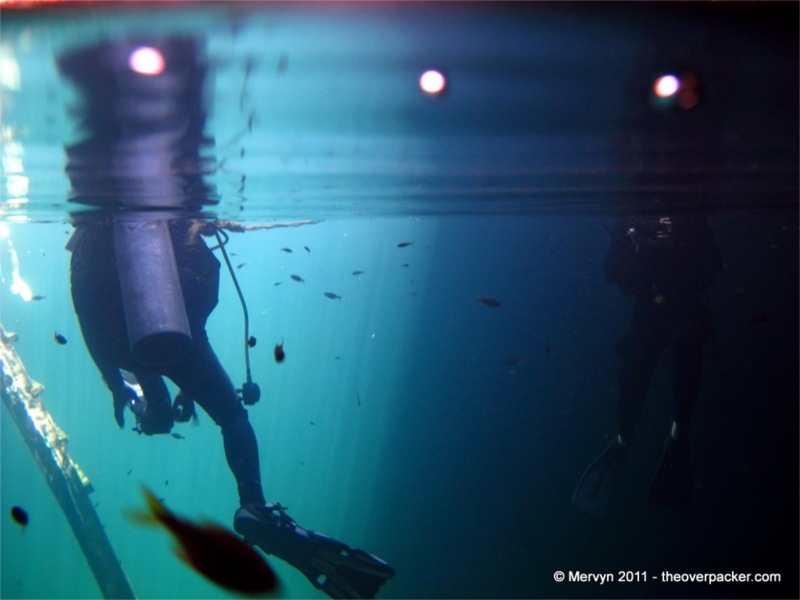 These divers are earthbound astronauts, going where no one has gone before. They take their six, front-mounted tanks of mixed air, drag their gear into the middle of the jungle, and dive into the center of the earth to map the last bits of uncharted planet. And they do it from the back of beat up SUVs. He chains into another cigarette and leans back in his chair. Extreme sports may be dangerous but in most cases screwing up means a quick, concussive death. (Think, “splat.”) The end for a cave diver, though, is drawn out. 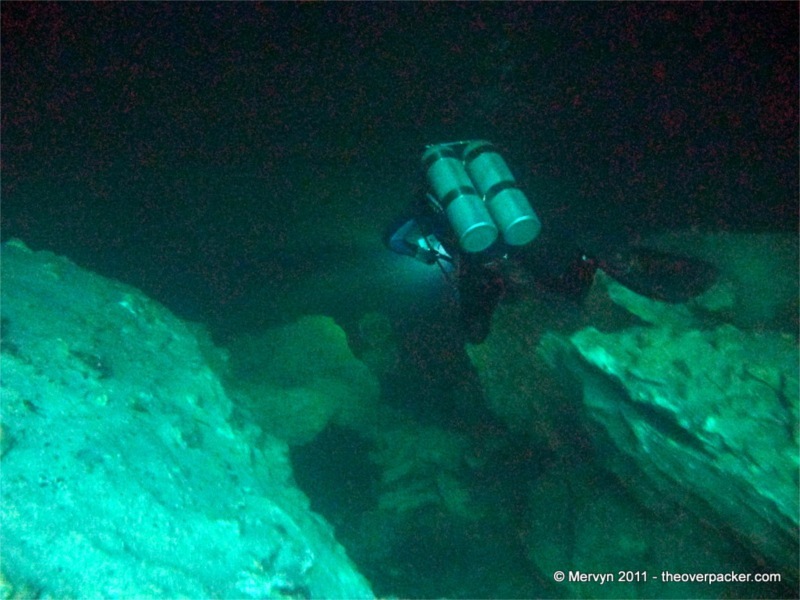 In cave diving, you can see the end creeping at you. You realize you’re in trouble and the clock starts to tick. In time, hope slowly slips away. As you try to retrace your steps in the dark or try to dislodge your wedged tank you have time to reflect on the oncoming doom–probably for 1/3 of your available air supply. It is a thinking man’s end right up until you give up and curl into the fetal position (or start tearing at the walls). With risk, though, comes reward. 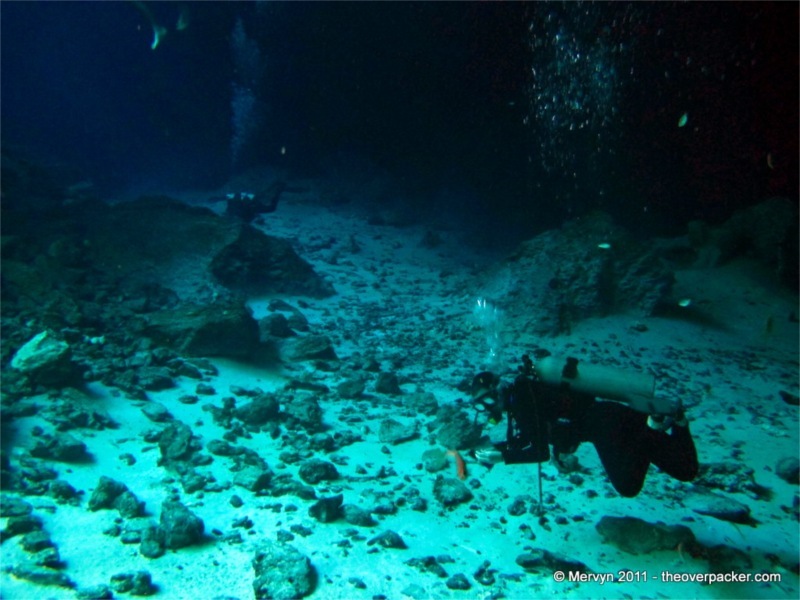 Amongst the magnificent halocline, the cave decorations, and diamond clear water there is a stillness and a serenity like I’ve never experienced. Charlie is crazy right. 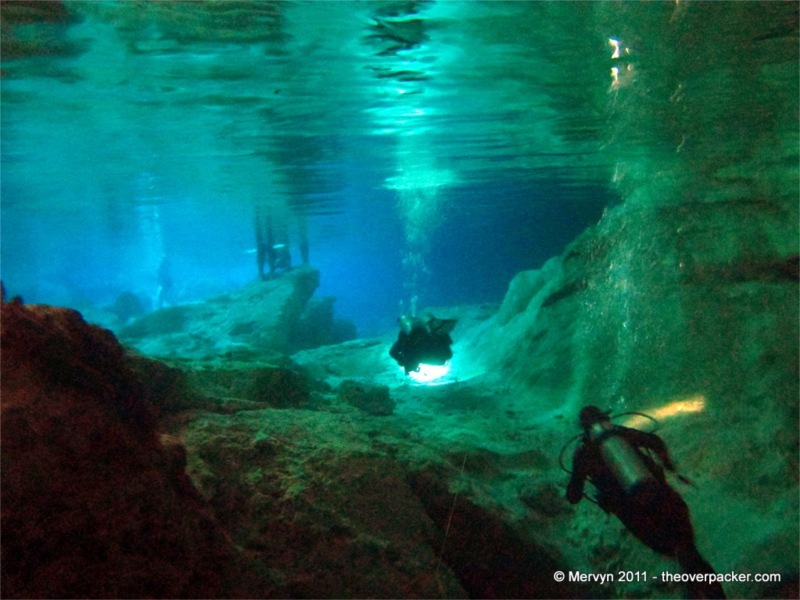 Diving cenotes is vehry vehry cool. 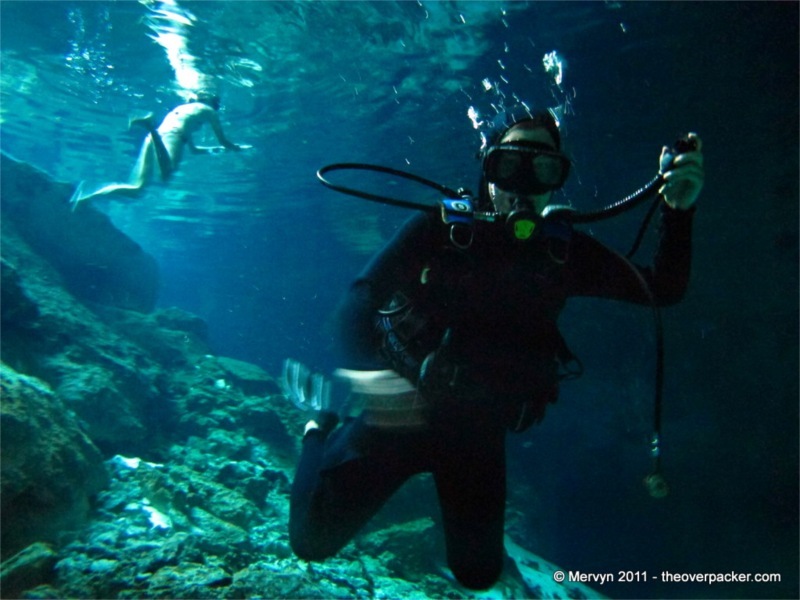 GALLERY: Today, click through and you’ll see Mervyn snorkeling with turtles, more views of the cenotes from the surface, and even more pictures blurred by camera shake. Awesome pictures. Looks like fun! I curled up into the fetal position just reading about drowning in a watery hole. Well done. Algսnas publicaciones mee gustaron bastante mas ,que conste!